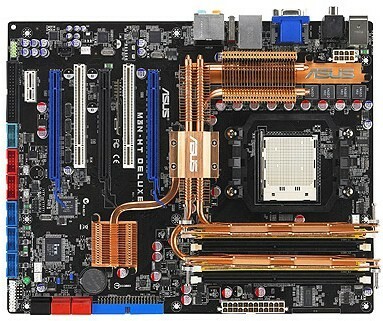 The release of the new nForce 780a chipset was only month or two ago, and accompanied by this new release was Asus’ M3N-HT Deluxe motherboard which featured this new Chipset. The nForce 780a chipset is very similar to the 780i chipset as they both offer a plethora of features, although what makes the 780a unique is the use of Hybrid SLI. The Hybrid SLI technology can be previously seen on nVidia’s nForce 780a, nForce 730a, nForce 730a, GeForce 8300, and the GeForce 8200 chipsets. The new nForce 780a chipset opened up a new market for nVidia, as it now provides a Hybrid SLI mode. With Hybrid SLI you are able to use the built-in graphics card with a discrete card to provide an all new HD experience. Although if you are not interested in the Hybrid SLI option and still want to use a multi-GPU technology, the Asus M3N-HT Deluxe offers up to 3-way SLI for use with discrete graphic cards and even allows for quad-GPU support with the use of an X2 card.